Getting a new computer is a bit like moving into a new house: At first, there's plenty of room for everything. Then, a few months or years go by, and you find yourself surrounded by random clutter, wondering where all that free space went. I may not have much advice on de-cluttering your house, but if it's your hard drive space you're looking to reclaim, TreeSize Free can provide you with the answers you need. TreeSize Free 2.7 shows drive contents as a list sorted by size, with simple and clear bars indicating relative size. TreeSize Free is as straightforward as software comes. You don't even have to install it if you don't want to: Maker JAM Software offers an official portable version at the company website. 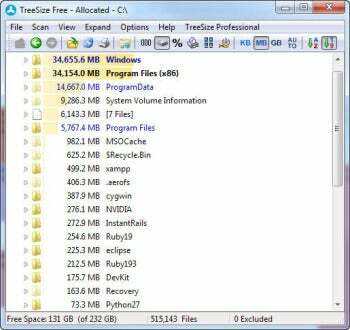 To compile an accurate report, TreeSize Free must have access to all files on the drive you're scanning. For this reason, it launchers under an Administrator account by default. Once you're in the application, just pick a drive to scan, and let TreeSize do its thing. It took about a minute to scan a 465GB drive with 207GB of occupied space spread across 195,000 files. Free competitor SpaceSniffer took roughly the same amount of time to scan the same drive. While scanning time is comparable, TreeSize and SpaceSniffer use very different interfaces. SpaceSniffer visualizes disk space using something called a treemap, which is a grid of nested rectangles of varying sizes reflecting folder or file size. TreeSize opts for a more utilitarian approach, arranging folders as a list sorted by size. Its only touch of visual flair is a gradient bar displayed behind each item on the list, showing the relative amount of space that item occupies. It even lets you pick the colors for the gradient. The interface is generally responsive, except for the Scan menu, which lagged for over twenty seconds every time I clicked it. The list format lends itself well to printing, and TreeSize Free includes an option for generating a nice printed report. This report is more comprehensive than the on-screen display, because it includes all metrics for every folder: Size, allocated space, number of files and folders, percentage of parent, and change/access times. The on-screen display lets you access all of this information, but only one metric at a time (i.e, you can show either the size or the percentage, but not both at once). TreeSize Free is a lean utility that does just what it's supposed to do. I only wish the Scan menu were as snappy as the rest of the interface. Account for every folder on your hard drive, and print out a wasted-space report.